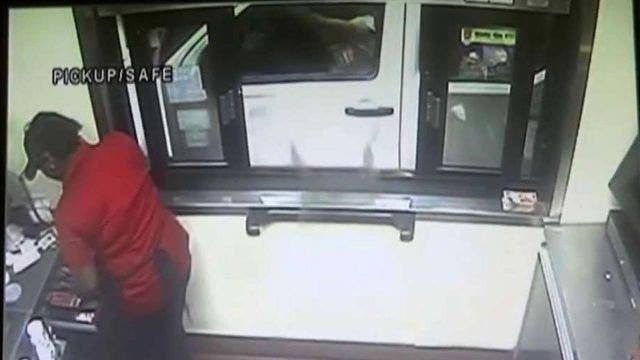 Surveillance video released Thursday shows a Florida man flinging a live alligator through a Wendys restaurant drive-thru window, providing new details on an incident that occurred in Palm Beach County last October. In the video, Jupiter, Fla. resident Joshua James can be seen paying for his beverage order around 1:30 AM, then, as the female cashier turns her back to the customer to get change, James is ensure flinging a blurry object through the drive-thru window and quickly driving away. That object was a 3.5 foot alligator James afterwards claimed to have found on the side of the road, according to Florida Fish Wildlife and Conservation officials . The Wendys employee first appears to be smiling at the reptile but soon gets scared and moves to the ledge of drive-thru window before lunging herself outside. The surveillance footage from Wendys was provided to The Smoking Gun in response to a Liberty of Information Act request filed with Florida prosecutors. In February, James was arrested and charged with assault with a deadly weapon without intent to kill, illegal possession of an alligator and petty stealing. After posting $6,000 bond, James was legally banned from all Wendys restaurants and is prohibited from linked with any animals except current family puppy. He was also ordered to undergo a mental health evaluation and to avoid possessing any weapons. In February, James told WPTV that is he “sorry for what he did” and that he “was just being stupid and not thinking.” He claims his “pranking” days are now over. James was scheduled to appear in court at the end of last month but an official with Palm Beach County Clerk and Comptroller’s office told FoxNews.com that his tribunal date has been postponed until May.